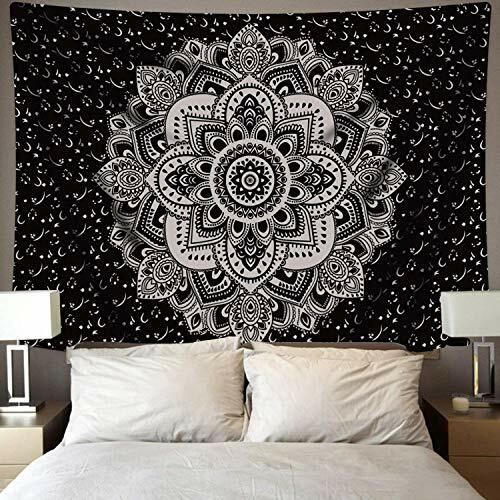 MATERIAL: your new tapestry wall hanging is made of Polyester, super soft and skin-friendly, durable and fast drying. TRADITIONAL INDIAN DESIGN: advanced technology is applied to print the traditional indian patterns. Popular mandala bohemian hippie style will satisfy you. 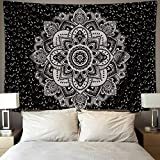 MULTI-FUNCTIONAL: Perfect for indoor use (wall hanging, home decoration, tablecloth and window curtain) or outdoor use (beach cover up, beach tapestry and etc). Black and white color add joy, peace and relax to your home decoration. GREAT GIFT OPTION: Great gift for each holiday to parents, grand-parents, aunt, sisters, friends etc, matches with any color. We offer 3 size for you to choose: small size(130*150cm/51"x 59"); large size(150*210cm/59.1"x 82.7"); x- large size(180*235cm/70.9"x 92.5"). 100% MONEY-BACK GUARANTEE: If you don't like IceJazz wall tapestry for any reason, you can just take advantage of our ONE-YEAR guarantee! We will replace it or give you your money back for any reason! NO QUESTIONS ASKED!